Hanging plants from ceiling or wall is good if you have children, pets or if you are not having enough space on your floor. To hang the plants from the ceiling, you need to insert a hook into the ceiling for the plant’s stability. Hanging the hook incorrectly can cause damages to your plants as well as the ceiling. Today on our blog, let’s check out how to hang your plant to the roof safe and secure. There are two ways through which you can hang your plants to the roof securely, through the joist and with the help of the toggle, proceed below to find the ways. The first step is to calculate your weight of the plant and basket to determine the size fastener you are in need of. If your hanging plants are less than five pounds, you can use an adhesive hook. These are available in various sizes and simple to remove without causing any damages to your paint on the ceiling. If your plant is above five pounds, you will need two hook screws for hanging, install those two screws in the angle that faces each other but not directly vertical. The next step is to purchase the hook screw to fit at your ceiling. These are small fasteners that consist of curved hooked and a threaded end; you need to get the one that equals the weight of the plants. You can use cup hooks if the item is small and screw eye hooks for tiny items. You need to get some large utility hooks for heavier items, that is robust enough to hold the plants. The next step is to check out your nearest ceiling joist in which you are going to hang your hook. The joist is considered to be the beam that supports any ceiling, this is the safe place for fastening the hook. You can use the stud finder to locate your ceiling joists. Use knuckles to knock on the ceiling; you can experience the hollow resonant sound between the area of the joist. The joist will produce a firmer sound. Make sure the ceiling joist are spaced about 16 to 24 inches from each other, once you have found the location and fixed the joist, now you need to locate the next one by using a tape measure, this need to be also between 16 or 24 inches. With the help of the pencil, mark the particular hook screw location once you find the desired joist. Now use an electric drill for placing a hole within the ceiling joist, these pilot hole can be used for screwing up the hook screw within the roof by your hand without any damages. Make sure you choose the drill that has the same diameter as the hook screw threaded shaft for the efficient and opt performance, if you are choosing the wrong screw then you will not be able to adjust the hook screw into the ceiling perfectly. Another important thing is that the pilot hole needs to be deeper than the hooks screw’s length. The final step is to locate the latch pin pointed tip to the hole; Twist is clockwise until it gets deeper. You can get help with the pliers if you have any trouble in twisting, once the base of the hook is flushed with the ceiling, you can stop twisting. In this method, you will use a toggle instead of a joist; you need to plug the screw into the ceiling hook through the hole, now thread the toggle to the bolt’s end. Now using a drill, place a pilot hole in between the toggle and the screw. You need to keep pushing the toggle upwards until you hear the toggle place perfectly into its position on the opposite side of the ceiling. Pull down the hook slightly to hold the toggle in opposite to the roof and then tighten the screw, once you found the hook base is flushed into the roof you can stop tightening. 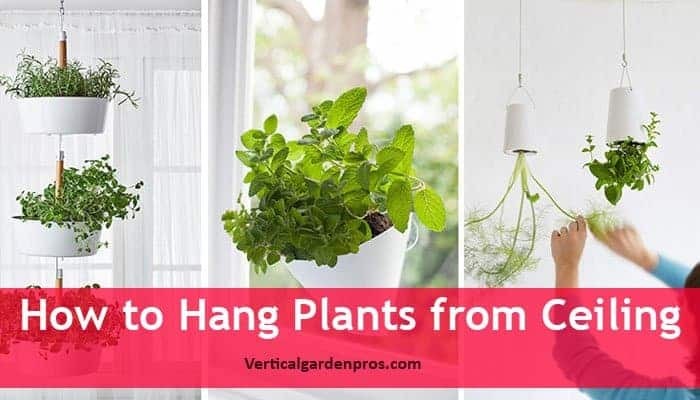 Following these two methods carefully can help you in hanging any heavy plants to the ceiling securely and safely. If you have any queries regarding the topic feel free to contact us through the comment section below. Do you know some other options or method for hanging the plants from ceiling safely? If yes, please share it with us!